This easy Cashew Tiger Butter is a delicious combination of chocolate and cashew butter ~ let the kids help you swirl the layers together! Line a standard baking sheet with a silicone mat, parchment, or foil. Put the white chocolate and the cashew butter in a microwave safe bowl and heat on high for one minutes. Remove and stir until the chocolate is melted and everything is combined and smooth. Microwave for a further 15 seconds if necessary. Don't over heat. Put the dark chocolate chips in a small microwave safe measuring up and heat for 1 minute. Stir until completely melted and smooth. Pour the cashew butter mixture out onto the baking sheet. Spread it out with an offset spatula until it is approximately a 8x12 rectangle. Don't stress over the exact size, your bark can be as thick or thin as you like. 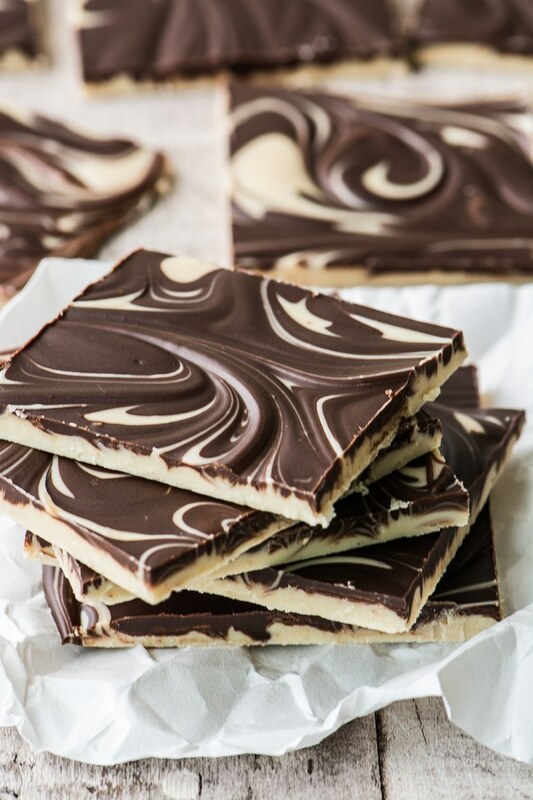 Drizzle the dark chocolate over the cashew layer in long stripes. Take the pointed end of a chopstick and swirl the layers together. Let the chocolate sit until completely firm. If your house is warm, put the tray in the refrigerator. When the bark is solid, remove it from the silicone or foil, and cut it into pieces. Keep chilled until ready to eat.